The fetching Sheralyn and I are in for a treat tonight [Saturday] as we once again get to hear our great Houston Symphony Orchestra as they are generously performing a free concert at Houston Baptist University [instead of the regular venue at Jones Hall in downtown Houston]. The strings will be prominent tonight with two pieces from the extreme eras of the masters-the Baroque and Romantic. From the Baroque era of music we will have Antonio Vivaldi's "Four Seasons" and then the great Romantic era composer Peter Ilyich Tchaikovsky will be featured with his luscious Serenade for Strings in C-Major. Vivaldi's "Four Seasons" is a set of four short violin concertos, each concerto representing one of the four seasons. 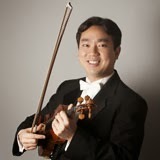 We are lucky that the solo violinist performing the concertos will be Houston Symphony very own concertmaster, Frank Huang. Mrs. B and I have had the pleasure of seeing Frank in one of the pre-concert lectures they have at Jones Hall called prelude. In that meeting we have found out besides being such a great concertmaster and supreme virtuoso violinist, Frank is an extremely nice gentleman. Houston is lucky to have such a great concertmaster. Tchaikovsky's Serenade is a beautiful four movement piece for strings. While there will be just the string instruments from the Houston Symphony Orchestra performing this piece, you might think this won't produce the big sound that a Tchaikovsky orchestral piece usually does, but you would be wrong. From the start this grabs you with a big wonderful warm sound of beauty. The bright nature of the piece represents its C-Major key very well. So, with Vivaldi's violin concerti and Tchaikovsky's serenade for strings in C-Major, the strings do indeed rule this concert night in Houston. As usual, whenever Sheralyn and I go to a symphony concert, Tales likes to give you a taste of what we will be hearing tonight. The first video will have the first movement of Tchaikovsky's Serenade for strings. In this video you will not see a conductor in front of the strings, but that job will be taken by the concertmaster, Nadja Salerno-Sonnenberg, who you will see sitting in the first row of the violin section closest to the audience. I have told you in a previous post how the concertmaster acts like a second conductor, well in this case she acts like the only conductor. You may pick up a nod here or a glance there to the other string players. The second video will have the Winter concerto, my favorite concerto from Vivaldi's "Four Seasons." As with a classical concerto each season [violin concerto] has three movements. In this Winter concerto in F-minor [the fourth concerto] the 3 movements are: 1. Allegro non Molto, 2. Largo, and 3. Allegro. Please turn up the volume and enjoy the strings.